To accompany his current exhibition at Outline Editions, godfather of graphic design Anthony Burrill will be hosting a second live workshop on Saturday 16th July from 10.30 – 5.30. During the workshop, Anthony will be inviting the public to take part in creating their own Burrill-style prints, using bold typography and collage techniques to produce one-off designs. Email info@outline-editions.co.uk to book your place. The workshop accompanies the current exhibition Clear Your Head Every Day, an exhibition of 30 news works by Burrill which hang in the once-pop-up-now-permanent gallery space, dedicated to all things graphic design. Burrill and Michael Marriot have redesigned the space, with custom made windows. Exhibition runs until 16th July at Outline Editions, Berwick Street. 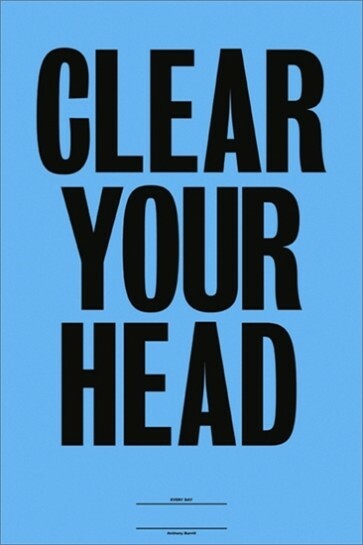 This entry was posted in NEWS and tagged Anthony Burrill, Clear Your Head Every Day, Outline Editions, Workshop. Bookmark the permalink.